Modern electronics mean graders like the XCMG GR100 are much easier to work with on site. 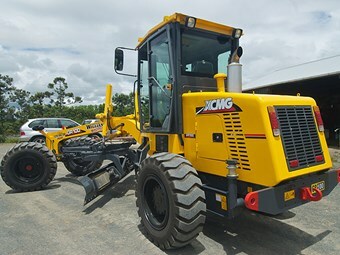 The seven-tonne XCMG GR100 grader is particularly suited for sites like dairy farms, which absolutely must keep roads leading to milk sheds in good condition. According to contracting folklore, good grader drivers are worth their weight in gold, probably because a lot of the work they do is by "feel". Thanks to the wonder of electronics and gadgetry, this is something that is becoming less common on job sites these days. Tauranga-based, Landex Ltd has been marketing XCMG equipment in New Zealand for years. I recall mentioning a year or so back, that New Zealand dealers should be keeping a close watch over their shoulders on Chinese equipment, and I'm sure the latest offering from XCMG will make them keep an even closer watch. 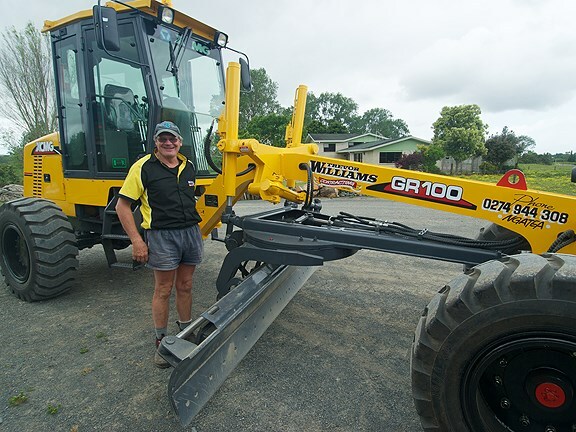 Grading work on rural farm roads was one reason why Ngatea-based contractor Trevor Williams chose the seven- tonne XCMG grader. Dairy farms in particular need to keep their roads to milking sheds in top condition so tankers don't run into trouble when collecting the goodies. 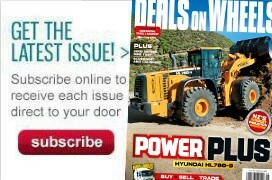 Also, with the high number of lifestyle blocks out there these days, the last thing people want is the muffler of their Toyota Prius being detached by rutted out access ways. So, being based in the heart of Waikato farming country, the need for a reliable grader is paramount to a serious contractor's arsenal. Williams' new machine replaces an older grader, which although still in good working order, probably didn't best reflect the expectations of some customers these days. Unlike some cryptic concoctions that other manufacturers name their models, the little two-wheel drive grader is simply called the GR100, which is fitting as the whole machine is quite a simple little piece of kit. Featuring articulation and the ability to angle the blade by up to 70 degrees, this machine is more than suited to working in rural areas and medium-sized construction projects found around the New Zealand countryside. With a minimum turning radius (using articulation) of 5.9 metres, the grader can spin around a dime fairly comfortably. The GR100 is primarily for use on road projects, and to keep costs down XCMG have not placed a rotator on this model, meaning the blade cannot be lifted alongside the machine to cut banks and batters. The GR100 runs a Cummins 4BT3.9 turbocharged engine, rated at 75hp. Access for daily checks and filter servicing is gained by opening doors on either side of the engine cover. What I liked about this is it is really easy to remove the starter and get in to bleed the fuel pump - both of those tasks can be a problem to carry out with some other machines. Should really major work need to be carried out, the whole cover can be removed fairly easily. Nicely set out, the interior has wide views from the expansive ceiling to floor windows. Looking out to the rear, the machine slopes downwards sharply to provide the widest viewing area as possible. Located on the right side of the seat is the simple control panel, along with radio and gear lever. The dash is kept small and compact to afford better forward viewing - this would be quite a nice spot to spend a working day. Before discussing the test, I feel it is only fair to let you know that I do not claim to be an experienced grader operator, having last been on one at least fifteen years ago. With that in mind, I approached the task of using the grader from the aspect of a learner operator. But actually, after being on the machine for a few minutes, I was quite surprised at how my operating skills from other machines began to surface. Feeling how the machine was responding, it was not too unlike using a traxcavator where, like a grader, you have to 'feel' your way along, with the various adjustments used to make the 'feel' better. The machine certainly felt responsive to the fine touches it needed when grading the parking area of Williams' yard. The myriad of controls available enabled me to set the blade on just the right angle for the slightly sloping yard. At the end of each run I was able to articulate the grader and spin it around easily in the tight area at the end of the yard. One thing I did have problems with was the forward and reverse, which for some reason I kept fumbling with, as it didn&rsquo;t feel natural to me. The rest of the controls were fine to use, and were positioned where I instinctively reached for them. There wasn't the opportunity to test the machine out on some piles of newly-tipped gravel, so I wasn't able to judge the machine's pushing power, and with it being two-wheel drive, I couldn't tell if it would bog down when handling a heavy load. I don't think it would be vitally important to have four-wheel drive at all times, but there would probably be some rare instances where this two-wheel drive version wouldn't be able to handle the work. Who is the machine suited to? This machine is well priced for a medium-sized contractor's bank account. Ideal for small to mid-sized jobs, this is a no-nonsense machine that would be a welcome addition to any fleet. 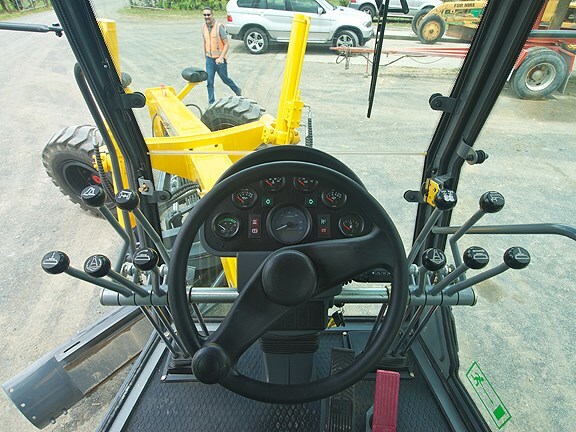 There is a formal qualification available for motor grader operators. NZQA Unit Standard 17311, Level 3, 20 credits. It is part of the domain - Civil Plant Operation.